I left Billericay school in September 1954 and like many young people then, I did not know what sort of work I wanted to do. Fortunately, the father of a friend of mine (Mr Owers) worked for Churchill Johnson and he told me they wanted somebody to work in the main warehouse. At the time I was living in Great Burstead on the apex of Kennel Lane and Mill Road. On my first day of work I walked to the top of Noak Hill to wait for a bus and thought how bright I had been by looking up the timetable but after waiting past the time it should have arrived, it dawned on me that I had looked at the Sunday timetable and not the Monday one. By this time it was well past 8am, my starting time. Luckily my friend’s father, in a black Austin Somerset car, pulled up and gave me a lift in. He said “not a good start”, so the next day I used the old bike I had purchased when I was 13. The problem was, it was now too small for me, so on the Saturday morning I went into Billericay and purchased a new Phillips bike with hub dynamo lighting. My job entailed sweeping out the main warehouse twice a day, lighting the canteen fire and the ideal standard boiler for the main office block, both these had to be kept going, though the canteen only up to dinnertime. This was in between my main role of getting up branch orders for tools, helping to load the lorries for deliveries in the mornings and unloading and storing away supplies such as baths, nails (in hessian sacks), rolls of sheet lead, bricks, basically anything to do with the building trade. This was all done by hand, no forklifts or trucks in those days. The bricks came from the London Brick Company on flatbed lorries with a tailgate but the sides were sloped into the middle so the bricks would not fall off, no sheets or rope to secure them. I can remember a tipper full of bricks coming in one day all jumbled up and we had to sort and stack them. Another job I was given was to wire brush some Crittal metal framed windows which had been stored outside and had gone rusty. After cleaning them I had to paint them with red oxide. As one would expect in this environment there was the odd accident and on one occasion I had to move a 45 gallon drum of linseed oil. I had placed it on a sack barrow but inside the warehouse was a slope and I tried to push the load up with both feet. I was wearing hobnail boots which slipped on the concrete floor which resulted in the drum and barrow trapping my hands between the handle and the floor. I had one fingernail torn off and a couple of fingers split. I was taken to Billericay Hospital for first aid, a lesson well learned. Another accident I witnessed was when some galvanised pails were being pulled up to the upper floor by a rope and pulley. They slipped and about five of them fell down on the head of one of the chaps (pop Bloomfield I believe). Luckily it did not kill him but it did require a hospital visit. One mistake I made was to fill up the nail hopper with 2¼”and 2½” lost head nails – a couple of weeks later I had to sort them all out. My work became more varied and I found myself working on the paint and wallpaper sections when others were either sick or on holiday. After a year I transferred to the light iron section, gave up sweeping but still had to keep the home fires burning. The Office Manager complained on one occasion that it was getting cold and this made me angry as I was always busy, so I kept piling the coal on. I bet the steam was coming out of their ears. Following the floods of 1957/58 winter I had to bail out the small boiler shed as it was two steps down and the water was level with the top one. It’s strange the odd things that stick in one’s mind, I remember finding a piece of coal that looked like gold, I thought I was rich but was soon laughed at when I found out it was fool’s gold (iron pyrite’s). Coloured cement powder, yellow, red, and green all in hessian sacks – I wore no mask. Sheet lead which we cut to size with a Stanley knife with a curved blade, wallpaper rolls placed on a hand machine which cut the borders off as it unrolled. Getting covered in cement and lime dust when helping the yard gang unload a lorry. Cutting off to length, galvanized pipe and placing it into a hand machine to re-thread the ends. Shouting out ‘whoa’ to lorries backing up to the loading bays. When wooden fence panels started to be made, a tank was put into the ground at the top of the yard and filled with creosote so they could be dipped. The rolls of pink fibreglass that caused small red pimples on our wrists and hands, I did not appreciate they were made from glass. The glazier who cut the glass sheets amazed me with his skill. He cut me a new headlamp glass for my old motorcycle, cost 6d in old money. The Lorries that Churchill Johnsons had were Fordson 30cwt with a V8 petrol engine and 6 volt system; they were a pig to start on a cold damp winter morning. Another vehicle was a Land Rover and a few times I went out with a chap called Toomey. It had the exhaust pipe at the rear extended up to the roof that was adapted from a galvanized water pipe that was made to go between a toilet cistern and the pan, it worked very well. Returning to my bicycle. After a year I purchased an auxiliary engine that fitted to the front and had a grit covered roller that fitted the special front tyre that I had to buy which had pump up to 70psi imprinted on the side of it. I must admit I never did pump it to that pressure as I was frightened it might burst. The 49 cc engine made by Villiers was encased in a blue metal casing with a Miller headlight in the centre of it. It also had a brass lever to enable the unit to be lifted up from the tyre, as it weighed about 40lb. I got a good turn of speed going down Noak Hill and about 20mph on the flat with the throttle wide open. This enabled me to sit alongside my friend Nobby Clark who also worked at Churchill Johnson while he was pedalling his bike. On one occasion when we had both just left work in the snow, my friend was on the left with his head bent down when I noticed a parked car. I assumed he had noticed it but no, and he ended up in the road having gone straight into the back of it “why didn’t you tell me” he said but it would have been to late by the time I realised he had not seen it. However no harm was done except to his pride. Back to my powered bike. I wanted more power but knew little about engines and Dad had noticed that the crankcase was cracked so he made up a cork gasket to go between the two halves of the casing. This, on a two stroke engine will affect the performance. So one weekend I decided to be clever and remove it and replace it with a paper one. Well as you would possibly expect, come Monday morning it would not start and having to pedal up Great Burstead Hill was no joke, it did not help when a passing cyclist shouted “get off and milk it.” So that evening I put the cork one back on. When it rained the roller slipped where it contacted the tyre. The first time it happened I undid the casing and accidentally put my hand onto the spark plug – this woke me up! I never did that again. The people I remember that worked at Churchill Johnson. Jim Whitehead (Wallpaper), Fred Sears (Paint), Pop Bloomfield and his two sons, Ken and ? (general duties), Jim Sutcliff (Foreman), Charlie Herbert (customers’ orders), Bill Clarke (Nobby – general duties), Harry Hallet (I took over from him on light iron), Eric Herbert, (no relation to Charlie – in charge of the garage – they did all their own repairs). Charlie got me interested in model aircraft and after his family moved from Berry Lane to Markhams Chase. We flew control line models there every Sunday morning and I still have my exercise book with notes I made of these flights. This I might add I carried with me during my National Service army training and my time in Germany. It was during my time in Germany when the Berlin Wall went up and I had do another 6 months service. 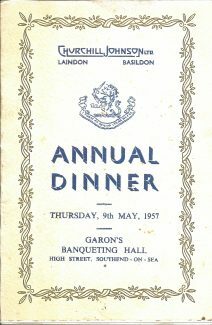 On the 9 May 1957, just over a year before I left the firm held their Annual Dinner at Garon’s Banqueting Hall, Southend on Sea. It was the first time I had been to such a function and I was a little taken back with the amount of cutlery in front of me but fortunately for me one of my colleagues came to my rescue and pointed out what order they were to be used in. More memories from my friend Bill Clarke re Churchill Johnson. Apparently under the concrete loading bay was a WW2 air raid shelter covered by a thick metal sheet. During my time there, over about 3years, I had never heard of this. Also he mentioned a Len Cross who drove the Bedford diesel tipper and a chap called Guy who took over a Bedford lorry from Harry Stockwell who retired while I was there. Any former workers from Churchill Johnson? In the canteen a motto was on the wall above the fireplace. Anyone remember what was written? My grandfather William Turner worked for Churchill Johnson after giving up his coal business. He gave this up after the Basildon Development Corporation compulsorily purchased his house and coal yard in Denbigh Road. He drove a Bedford van for the company effecting deliveries all around Essex and East London. I loved going out with him during the school summer holidays to such exotic places as Leyton and Walthamstow. Looking back, I think it was probably not cost affective to go all that way for just a few tins of paint or other small amounts of hardware. Perhaps that’s why they were eventually bought out by W.C. Ware? The company was called Churchill Johnson, not Churchill & Johnson. As far as I can gather, the business was established by Egbert Churchill Johnson. Churchill possibly being his mother’s maiden name. Egbert married Ethel Dowdall in Edmonton in 1910. 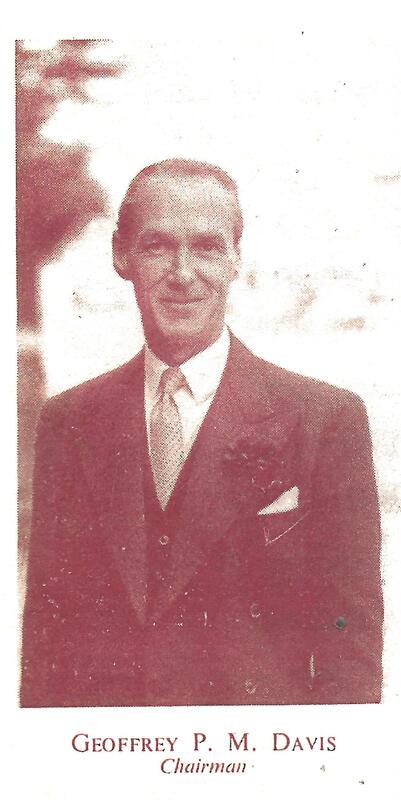 They had a son called Egbert Lloyd Johnson who was born in 1913 (birth registered in Billericay). The 1918 Electoral Register shows Egbert and Ethel living in ‘Veritas’, Laindon. I have a newspaper cutting showing that in 1926 Egbert had an accident at Vange railway crossing when the car he was driving was hit by a train. He survived, but the car was wrecked. (The L.M. & S. Railway Company was fined £100) He isn’t mentioned on the 1929 Electoral Register, so I assume he had by then moved from the district. Egbert died 7th October 1965 aged 78. His address at that time was 1 Cottage Grove, Brockings Elm, Clacton-on-Sea. Probate was granted to son Egbert Lloyd Johnson, a cycle dealer. 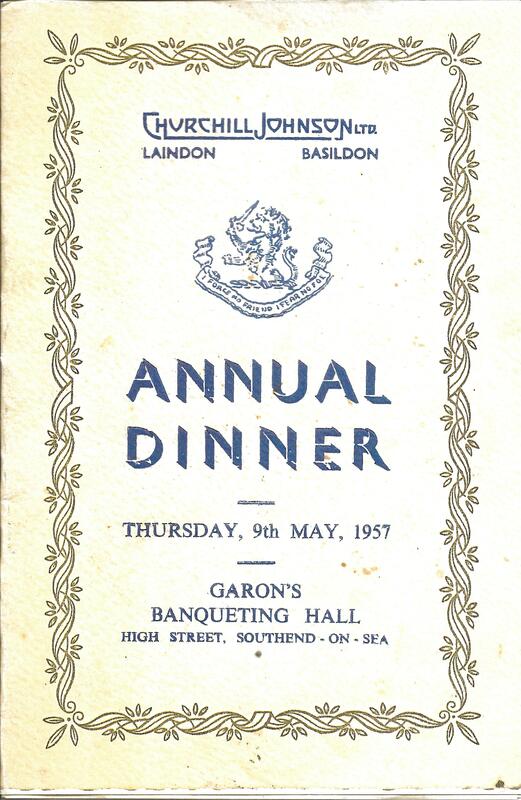 Laindon was the head office of Churchill Johnson Ltd but there had been branches in Billericay, Brentwood, Chelmsford, Grays, Hockley, Rayleigh, Pitsea and Wickford. Very interesting! In the 1950’s Churchill Johnsons had a large enough staff that they fielded at least one table tennis team in the local leagues. The only other works team that I can remember is Rotary Hoes at east (subsequently west, without ever moving) Horndon. I played for one of the Laindon Youth Centre teams and routinely played against both works teams. One Churchill Johnsons player was Mike Riordan. Or was it Mike Shannon? I remember him very well. Nice chap. I was attempting to court Peggy Garrard at the time, a class mate at Chelmsford Tech who lived in Billericay somewhere in the direction of the lake north of the railway station. Peggy preferred Mike. Such is life! I was expecting to see Mike’s name in those mentioned by Bob Howard. Perhaps he had moved on by the time Bob was there. I believe I am correct in saying that Johnson was one of the early builders in the area. Quite where Churchill came from or how they teamed up I have no idea. Surely it was the largest builders merchant in the area and the most successful. It had to have quite a large financial backing. I would have expected the Churchills and the Johnsons to leave more of a mark on the community given their business success. Something akin to the Toomeys for instance. Or perhaps they did and I am unaware of it.